Do you believe it was just the men that fought in the Revolutionary War? Well, think again. When you think of the American Revolution, perhaps you envision the Boston Tea Party, Paul Revere’s infamous ride, or George Washington crossing the Delaware River. But there are many other, lesser-known stories of the war that engulfed women’s lives as it did the lives of their fathers, husbands, and sons. Some women served as spies, nurses, and water carriers; some helped as fundraisers, writers, and couriers; and still others functioned as resistors, rescuers, and—surprisingly—even soldiers. Most often, their names did not make it into history books. 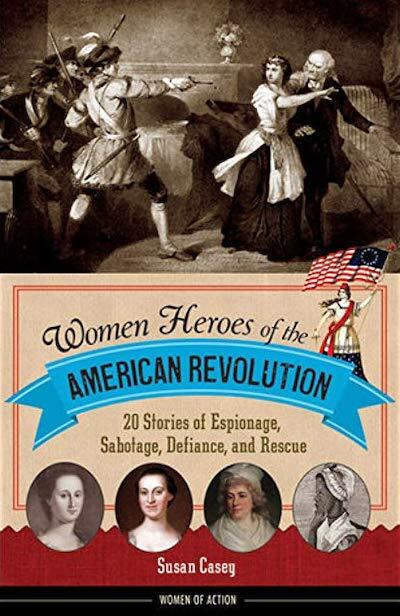 In Women Heroes of the American Revolution, twenty fascinating women step into the spotlight they deserve. You’ll learn about such brave rebels as Martha Bratton, who blew up a supply of gunpowder to keep it out of the hands of approaching British troops and boldly claimed, “It was I who did it!”; 16-year-old Sybil Ludington, who rode her horse Star twice as far as the legendary Paul Revere in order to help her father, Colonel Ludington, muster his scattered troops to fight the British; and Deborah Sampson Gannett, who bound her chest, dressed as a man, enlisted in the Continental Army as Robert Shurtliff, and served undetected for three years alongside her fellow soldiers.